The Port of Hamburg’s overall results for the first nine months characterized by export growth and an import downturn. In the first nine months of 2012 the Port of Hamburg achieved total throughput of 98.1 million tons (down 0.8 percent). General cargo throughput at 69.2 million tons was just ahead of last year’s figure (up 0.2 percent). Bulk cargo throughput at 28.8 million tons stayed behind the previous year’s (down 3.3 percent). 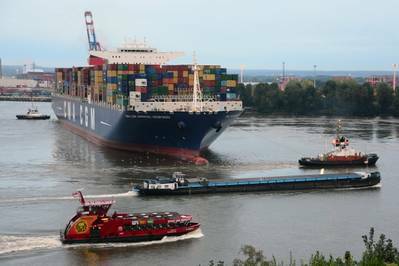 In the first nine months of the year, at 6.7 million TEU the container throughput so predominant in the universal port of Hamburg was just slightly lower, falling by 0.6 percent. The positive result on general cargo was caused mainly by growth in the handling of loaded containers; the total of 5.8 million TEU handled representing an increase of 1.8 percent. The loaded boxes were very largely going for export. In the first nine months of the year exports at around 2.9 million TEU were 6.9 percent higher than in the same period of last year. This positive trend in throughput on the export side offset the 2.6 percent downturn in imports of loaded containers, where volume reached 2.9 million TEU. At 1.6 million tons, total volume of non-containerized general cargo was 15.4 percent down on the comparable period of last year. While the trend for exports, including one million tons of conventional cargo, was positive (up 2.6 percent), throughput of imports at 545,000 tons was weaker (down 36.2 percent). The positive development of exports of conventional general cargo is primarily attributable to exports of vehicles, heavy cargoes and project cargo. The downturn in bulk cargo throughput was caused mainly by a reduction in imports of grab cargoes that at 11.6 million tons were 7 percent lower. Whereas exports of bulk cargoes at 7.3 million tons in the first nine months of the year achieved an advance of 6.1 percent, at 21.5 million tons the quantity of cargoes imported in this segment worked out lower than last year (down 6.1 percent). Although the Port of Hamburg had to book an 8.3 percent reverse in throughput in the Asia container trade at 3.6 million TEU, container throughput in all other trades still proved to be on a growth path. The downturn in the Asia trade is primarily caused by a problematical economic environment in Europe and the cooling off of China’s foreign trade, which weakened container throughput with China (incl. Hong Kong) that at 2.0 million TEU was down by 11.6 percent. All other container trades of the Port of Hamburg turned in positive throughput results for the first nine months of the year: At 2.1 million TEU, 7.3 percent more containers were transported between Hamburg and European ports than in the same period of last year. At 856,000 TEU, throughput in the America trade grew by 16.8 percent. Container traffic with Africa at 179,000 TEU represented an advance of 10.9 percent. Container traffic with ports in the Australia/Pacific trade reached 32,000 TEU (up 9.6 percent). In the America trade, the Port of Hamburg reported enormous growth in traffic with the USA, container throughput here climbing by 46.9 percent to 290,000 TEU. The USA has now advanced to become the Port of Hamburg’s fourth most important trading partner in container traffic. “In the first three quarters of the year the Port of Hamburg mainly profited from the strong trend in exports, which not only ensured a steady result on container throughput, but also growing export quantities in the bulk goods sector. Against the background of a cooling down of the economy in Europe and other parts of the world, for the Port of Hamburg this year we reckon with total throughput of around 132 million tons. In 2012 total container throughput will be of the order of 9 million TEU. For the continued positive development of the port, the implementation of outstanding infrastructural projects, e.g. the deepening of the navigation channel on the Lower and Outer Elbe, is the top priority,” stressed Claudia Roller, CEO of Port of Hamburg Marketing. Among the factors underlining the significance for Hamburg of the enlargement of the navigation channel is the trend in the size of ships calling in the port. Whereas in 2007 only 597 ULVs (Ultra-Large Vessels) called at the Port of Hamburg, by 2011 already 894 oceangoing ships with a length of more than 330 meters and/or a beam of more than 45 meters did so. On account of their outstanding size, containerships, bulk carriers and cruise ships in this category are subject on their passage up the river to the Port of Hamburg to special restrictions on maximum draft as well as a ban on passing by ships with a combined width of over 90 metres. “For shipowners with ships calling at Hamburg and other customers in industry, logistics and trade throughout the world, rapid realization of the planned deepening of the navigation channel will represent a marked improvement, guaranteeing the accessibility of the port by sea. Protracted litigation by interest groups may not lead to a standstill in the further development of the road, rail and inland waterway transport infrastructure that is so urgently required by our national economy and those of our European neighbours. The great bulk of German imports and exports are handled via Hamburg and other German seaports that represent a very important locational advantage for German foreign trade and all the jobs involved,” stressed Claudia Roller.